With so many beautiful holiday destinations on Queensland's Sunshine Coast, choosing your accommodation can be a bit of a task. However, we've compiled the following list of accommodation options to help make choosing your stay easier. There's everything from luxury holiday villas to family friendly resorts and self-catering apartments to ensure all travellers and budgets are catered for. The stylish accommodation of Noosa is right at home surrounded by Laguna Bay, the picturesque headland, the coast's only major beach and the boutique shopping, dining and luxury of Hastings Street. 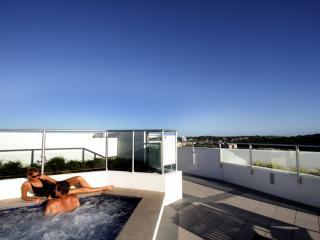 Renowned as the Sunshine Coast's star holiday destination, Noosa offers a great range of deluxe accommodation. Renowned as a surfing haven, Alexandra Headlands is a beautiful holiday spot ideally positioned to explore the surrounding Sunshine Coast. With some of the Queensland coast's best surf, the headlands provide breathtaking views of the Maroochy River and Mount Coolum. Known as the Sunshine Strip, Alex Heads also offers beautiful parklands to relax by. A popular holiday spot with families, Caloundra is home to the beautiful Kings Beach, Golden Beach and some top surf beaches. There is a great range of accommodation on offer as well as cafes, restaurants, boats for hire and fishing expeditions or you can simply relax and collect shells on the calm shores of the Pumicestone Channel. The large coastal town of Coolum is fast earning a reputation as the next Noosa with a rapidly expanding range of accommodation and attractions. Offering a relaxing escape from the hustle of a major city but with enough facilities to keep things interesting, Coolum enjoys an excellent range of stylish holiday apartments and spectacular ocean views. 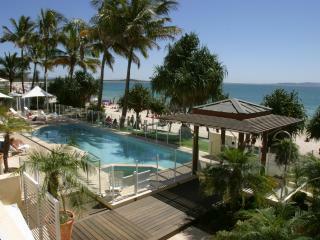 A smaller beachside town, Marcoola offers a peaceful place to holiday in the golden glow of the Sunshine Coast. Close to some of Queensland's best beaches, the excellent variety of accommodation offers a fantastic range of facilities and direct beach access. The ideal place to base yourself, Marcoola is conveniently located for exploring this beautiful region. Also the business hub of the Sunshine Coast, Maroochydore still enjoys the allure of a seaside town offering the best of both worlds. Offering plenty of family friendly accommodation, Maroochydore also boasts safe beaches, a great range of attractions and a variety of shopping and dining options. It is also home to the Sunshine Coast's best estuary fishing. Surrounded by a picturesque boat harbour and scenic surf beaches, Mooloolaba is a pretty little spit just north of Caloundra. Enjoying a more laid back vibe, Mooloolaba features boutique shopping, gourmet dining and a lovely esplanade. The Wharf complex is also a lovely place to spend the day and offers a bit of nightlife for those so inclined. Ideally situated between Noosa and Coolum, Peregian Beach is a leisurely lifestyle holiday destination offering fewer crowds than some of the more popular tourist centres. Close to a variety of shopping, dining, entertainment and activities, Peregian Beach accommodation offers all the comforts of home with the added bonus of a beautiful beachfront location. Enjoying easy access to the Fraser Coast and picturesque Fraser Island, Rainbow Beach offers a fantastic range of accommodation options surrounded by beautiful bushland. With many accommodation options enjoying direct beach access, you can choose from self-catering, family friendly, budget conscious and luxury accommodation with an excellent range of onsite facilities. Surrounded by spectacular views out over the coast and the Blackall Ranges, the Sunshine Coast Hinterland enjoys a quaint atmosphere and is home to charming markets, art galleries and gourmet restaurants. Most accommodation comes in the form of bed and breakfasts and guesthouses and the low key atmosphere of the hinterland is the perfect way to relax. 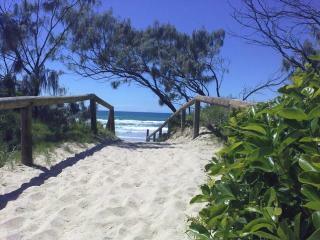 Just off the mainland of the Sunshine Coast lie World heritage listed Fraser Island and Lady Elliot Island. 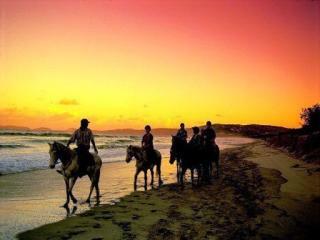 Famous as the largest sand island in the world, Fraser is an excellent 4WD destination and offers whale watching during winter. Lady Elliot is famous for its turtle rookery and is a haven for a beautiful natural environment, a variety of wildlife and access to the Great Barrier Reef.